When it comes to the weather outside, this time of year always feels like two steps forward, one step back. Last week we had a great day with temperatures in the 50's, only to be followed by a day of wet, heavy snow. When that latest layer of snow melted and I just felt defeated by Winter, I looked out by our woods and saw these. The daffodil bulbs I planted last Fall, starting to pop up. I am telling you, this mess of mud and leaves and tiny bits of green has been so good for my soul. I've been trying to make sure the kids get some outside time on those warmer days. Between that and a sewing deadline that I can't share right now, I don't have a finished project to show you this week. But I have accumulated some new fabrics recently and they inspired me to take a little break and build a project pile from my stash. 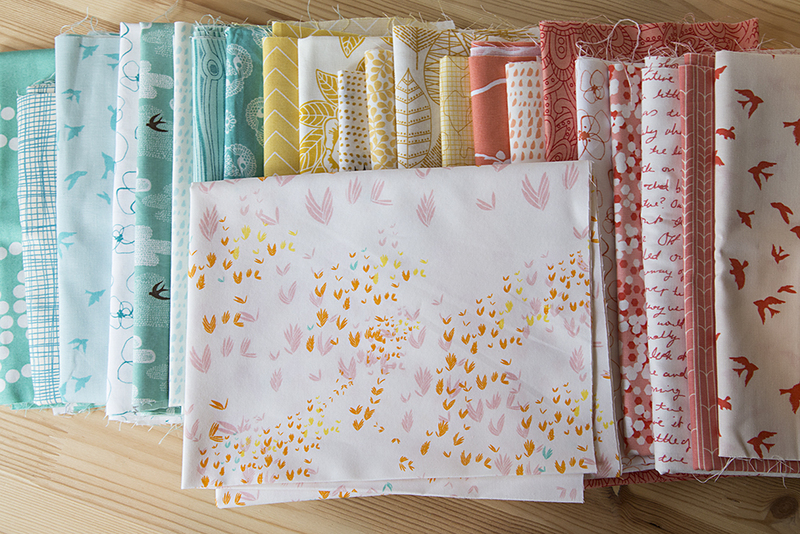 My inspiration for this stack was a print from Leah Duncan's newest fabric line for Art Gallery Fabrics, Meadow. I love the soft colors. I pulled some coordinating prints from my stash, including some new fabrics from Lotta Jansdotter's Mormor, Skinny Laminx's Up, Up & Away, Eloise Renouf's Bark & Branch, and Violet Craft's Waterfront Park. I made a block from my Off-Centered Squares quilt pattern. I'm thinking of using one color family per block...we shall see! Back to work on deadlines! And fingers crossed for a warmer week!